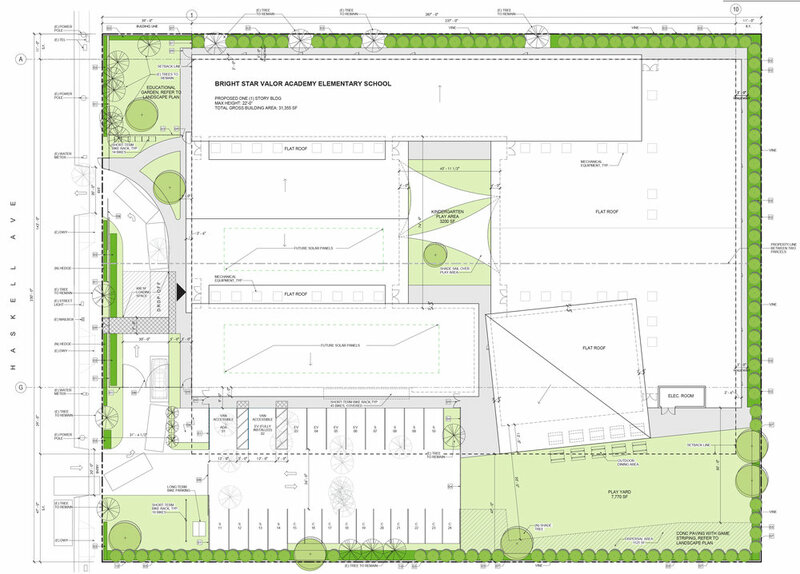 Berliner Architects is currently designing a one story new construction elementary school for Bright Star Schools. The building massing and envelope are responses to several environmental and contextual aims including creating a building embedded in the residential area. Natural light was increased with fenestration on the walls and skylights in the roofs, protecting direct light with overhangs, sloped roofs with the lowest side toward the neighbors, and punched windows on the South and West Sides. 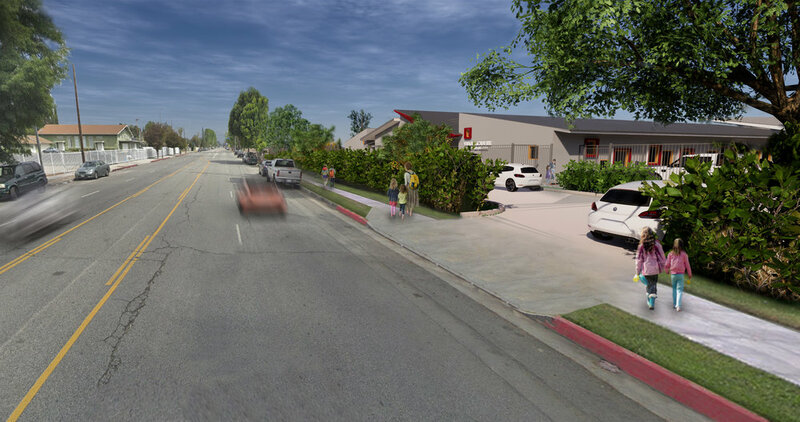 The school is near a major freeway, so noise and air pollution had to be considered in the design. The atmosphere inside the school is gentle and serene, using light grey colors with an accent color for the entrance and MPR. The kindergarten and TK (Transitional Kindergarten) classrooms are arranged around a central, open-air courtyard, which not only allows natural light to enter the heart of the building but also acts as a dedicated play area for the youngest students. Micro-spaces generated by the recessed windows to be used as seating areas, for reading, hiding etc. The sunshades shield the young students from the heat and the central location mitigates noise and air pollution from the adjacent freeway. The outer perimeter of the school will be lined with hedges to both add privacy to the play-yard for older students and to dampen noise and pollution. Landscaping and sustainability played big role in the design of the school. The lot was formerly a landscaping business and features many mature trees that are being saved wherever possible. Berliner incorporated existing trees into an educational garden on the North side that promotes outdoor learning spaces, letting the students spend some time in a mini garden with natural elements. Trees that have to be removed will be re-purposed as sitting logs in the garden and play-yard and used as siding for the school if possible. The sloping roofs of the school will have photovoltaic cells (PV) for generating electricity from sunlight installed on the southern facing slopes.